Outdoor Dog World is reader-supported. We may earn a commission when you purchase through links on our site. 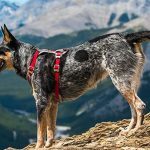 No one ever wants to think about anything bad happening to their dog, but when you’re on the trails, camping in the mountains, or riding the rivers, you need to be prepared for the worst. To make sure you’re ready for any emergency situation, we’ve put together a Complete Guide to Dog Hiking First Aid. 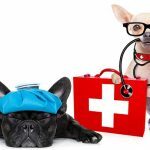 You’ll learn how to treat common canine injuries on the trails, what kind of first aid supplies you should always have on hand, and how to build your own doggy first-aid kit. 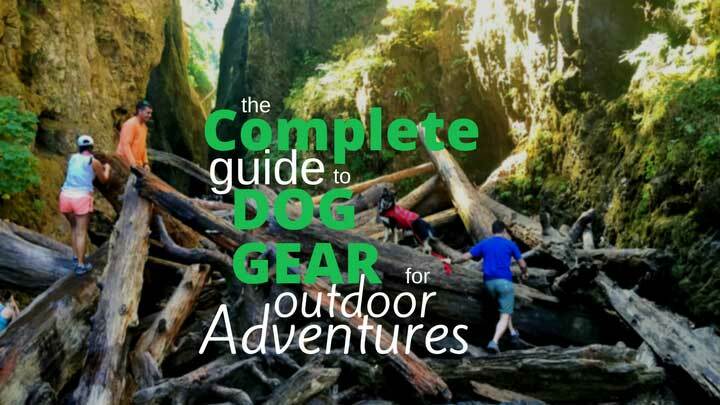 Follow our guide to be the most prepared hiker and hound on your next hiking adventure! While typically considered a minor injury, sunburn if left unchecked can become a bigger issue. Especially if your pup has a short, thin coat, you may need to use sun protection for hikes including prolonged sun exposure. There are several pet sunscreen options available, but you can also use a white t-shirt or reflective doggy vest on sunny hiking days. Keep in mind that you’ll want a lightweight vest or cover for your dog to prevent overheating. If your pup does get sunburn on a hike, it should heal on it’s own within a few days. To ease their discomfort in the meantime, you can generously use Aloe Vera gel over their coat to moisturize and relieve any itching that sunburn can cause. It’s not just skin you have to protect from sunburn, but perhaps more importantly, your dog’s eyes. 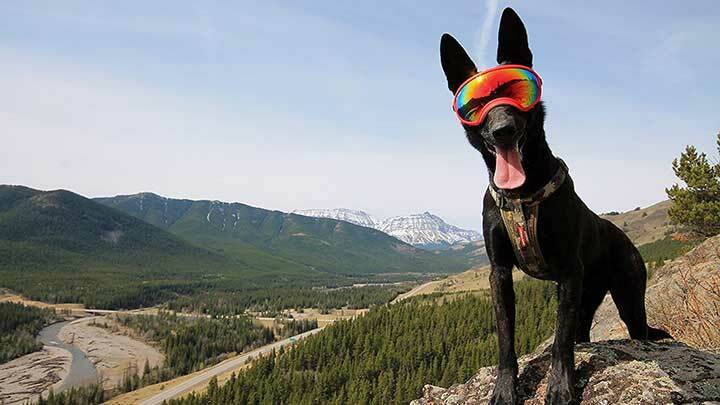 Check out our article on the best goggles for outdoor adventures with your dog. It may be hard to recognize at first, but heat exhaustion in your dog can get serious if left unchecked. If you notice your dog panting excessively, dragging their feet, or getting dreary-eyed, they may be overheating. Stop on the side of the trail somewhere in the shade and give them plenty of water to re-coup. If needed, you can use cool water on their stomach and legs to cool them off faster. You’ll typically want to take a rest for 10 to 30 minutes for your dog to regain their energy before starting up again. It’s hard to know what other pets or wild animals you’ll encounter on the trails. In the event your dog enters an altercation with another animal, be careful breaking it up. You could end up getting hurt yourself in the scuffle. Once the incident calms down (although we all know you’re going to try and break it up), be sure to check your dog (and yourself) very carefully for any cuts or bites. Use first aid materials to clean and dress any open, bleeding wounds and assess the need for stitches. If the wounds are deep, apply pressure to slow bleeding and take your pup into the emergency vet as soon as possible. If your dog comes in contact with poisonous ivy or plants, they may get a visible skin rash and have itching in the areas affected. Use a hydrocortisone cream to ease itching and scratching while it heals. You may inquire with your vet to get a stronger topical treatment for faster relief. If you believe your dog has eaten poisonous plants, get them to a vet immediately so they can induce vomiting and other treatments as soon as possible. While paw pads are typically very resistant to injury, a rough trail or spiky rock can nick your pup’s feet. Hiking boots can act as a preventative for any foot injuries. 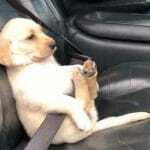 But if they do happen to tear their paw pads, you can use petroleum jelly or a paw-specific balm to moisturize and protect before applying a wrap bandage to add padding and keep the cuts clean from debris. They shouldn’t typically need more care than a normal nick or scrape and should heal up within a few days. A broken bone can be extremely painful and will typically be obvious in your dog’s behavior. 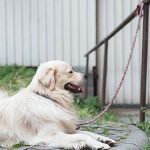 If they yelp out in pain, and proceed to limp or cease using one of their legs, it’s important to stop and care for them and carry them to the vet as soon as possible. In the case of a fracture, you won’t always be able to visibly see the break. Do your best to clean any visible puncture wounds, and use a stick and some cloth to secure the limb with a splint to immobilize it. Don’t try to re-align the bone yourself, let the vet do that. There are several first-aid items you can have in your arsenal to be prepared for any minor injury. 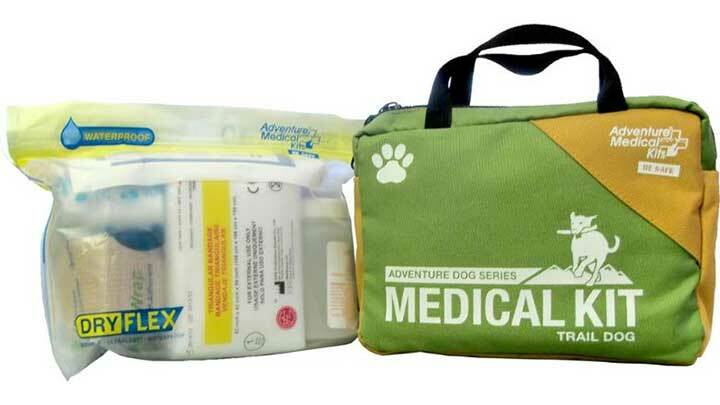 You’ll want to start with a dog pack or bag specifically marked for first aid use. It should be lightweight and accessible, whether it’s your only pack or a small clutch to pack in a larger bag. To make it easier we put all of the following together in an Amazon List here. Extra Water. Always have an extra water source on hand for emergencies. Your pet could overheat or need a cut or wound washed out thoroughly. You can never be too hydrated when navigating the outdoors. Saline Solution. Having saline on hand to use as an eyewash will prevent any debris from lodging in your pet’s eye and causing infection. Paw Wax. 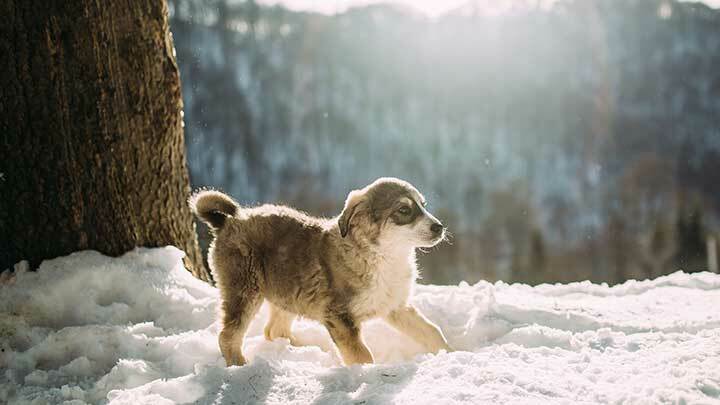 Any good petroleum jelly or beeswax-based balm will come in handy to moisturize and protect small nicks or scrapes, especially tears on the paws or ears. We like Musher’s Secret because it holds up in some of the most extreme environments. Benadryl. This antihistamine can be safely used for dogs to reduce allergic reactions caused by things like poison ivy or stings. You should ask your vet for the correct dosage amount before giving it to you pup. Anti-Inflammatory Medicine. Most human pain medications are not suitable for dogs, and can cause further injury. 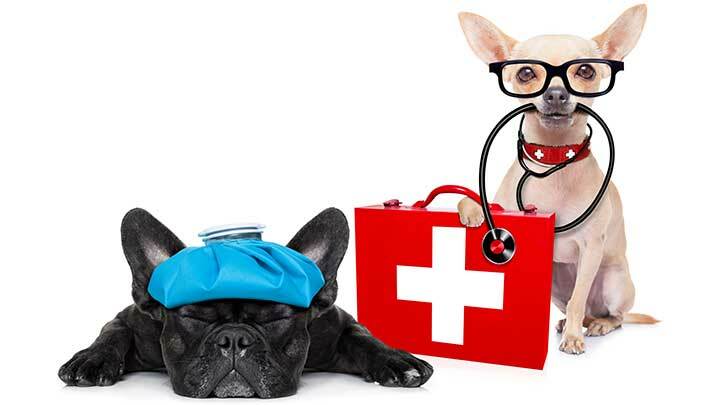 Ask your vet for the proper dosage of a pet-safe anti-inflammatory to help with pain relief if your dog is injured. Vet Wrap. This wrap bandage is used by vets and is extra-stretchy for canine injuries. You can ask your vet for some before embarking on your next adventure, and use it for wrapping open cuts or wounds. A Muzzle. 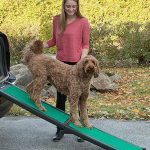 While you may not see the need for it at first, when your dog gets injured, adrenaline and shock responses can take over, making their behavior unpredictable. It’s best practice to muzzle your dog when they’ve been more seriously injured to prevent them from biting you or causing further harm to themselves. Tick Nipper. A tick nipper is a special pair of tweezers that can remove full ticks from your pup. 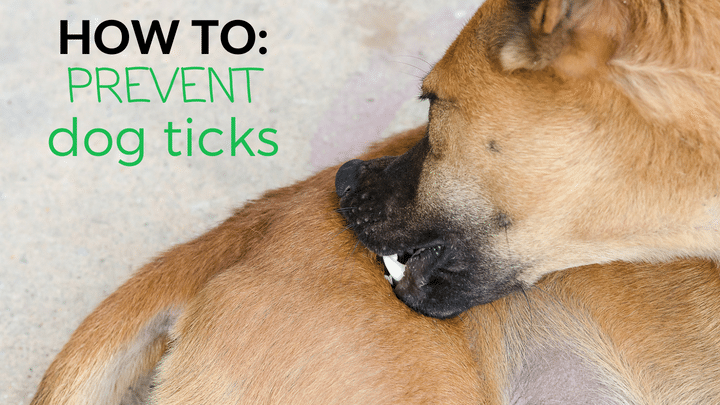 It’s important to remove ticks as soon as you spot them, as they carry serious diseases like Lyme disease. Check your dog often while on hikes, as they can hop on at anytime. A little prep before a hike with the right flea and tick prevention would also be smart. Styptic Powder. Styptic powder is typically used to stop minor shaving nicks and cuts from bleeding. It can also prevent further bleeding on small scratches your dog may get from hiking through heavy brush. It will seal the skin on minor cuts and help the healing process. Water Purification Tablets and Electrolyte Tablets. You’ll want to have these on hand to ensure you and your pup have plenty of available drinking water. Water purifying tablets will make natural water sources safer to drink and prevent bacteria, while electrolyte tablets can give you that extra burst of energy to make the trek back home. Emergency Blanket. 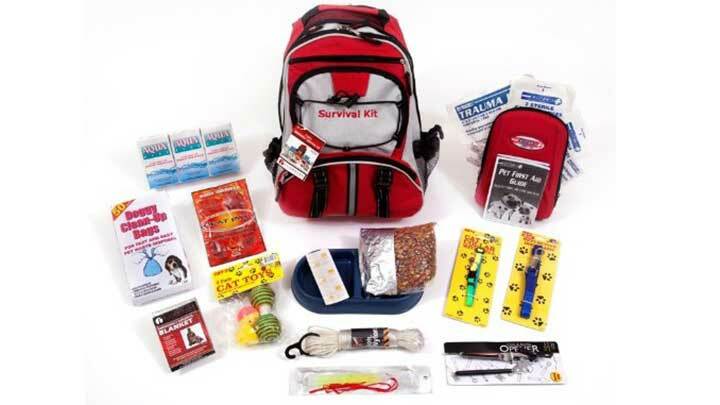 In the case you and your pup are stranded, you’ll need something on hand for temporary shelter. Emergency blankets can provide extra warmth or shade in a dire situation. Emergency Rations. It’s always a good idea to have an emergency food source on hand if you get stuck in a bind. Have something for you and your dog to ensure you don’t go hungry. Rope. A good amount of tough nylon rope can come in handy for various uses. It’s worth adding to your arsenal for all of the ways it can come in handy! Flares. Used as a source of light or as an emergency flare to find help, these come in handy no matter where you’re hiking. Neosporin and Nixall wound and skin solution spray for animals. This is good for hot spots, minor cuts, burns, scratches, insect bites, and for all dermal wounds and irritations. Straws. Straws are good to have in case of snake bite to the nose area. Swelling may seal the airway, so putting straws up nostrils may allow the airway open to allow for breathing. 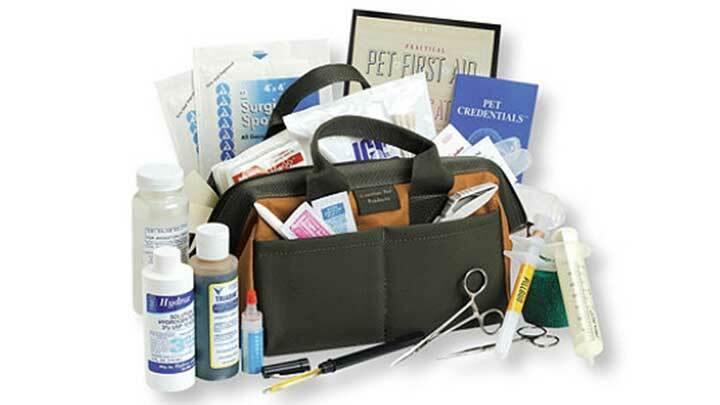 If you’d rather purchase a fully put-together dog emergency kit, there are several available on the market to fit you and your dog’s individual needs. Here’s some of our picks. According to the product description, this survival kit was designed using advice from experts in the emergency preparedness industry. It follows first-aid guidelines given by government agencies and non-profit preparedness organizations. It truly is an all-in-one dog survival kit. This first-aid kit includes everything you may need to clean and dress minor injuries. With just about every type of gauze and advanced tools for wound cleaning, this is a crucial kit for any animal bite or deep cut. This small medical kit includes everything you could need for an emergency first aid situation. At an affordable price, with a bag small enough to fit in a larger pack, it’s a lightweight option for day-time hikes. How Old Should Your Dog Be Before Their First Hike? 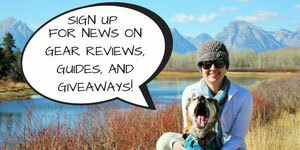 Each month I round up my favorite gear reviews, dog adventure guides, and run a giveaway. The people on this list get first dibs. Don't miss out on adventure guides, gear reviews, inspiring stories, and more. Better listen to him and sign up below!